Getting busy people in a room together to workshop is hard and a challenge I came across last week. I’m currently working at the wonderful ustwo as an Agile coach (who are currently hiring for Agile coach/PMs in case you were wondering). One thing that I was asked to help out with is a refresh of the guidelines around how to kick off a new project. As we had so much knowledge in the team, I wanted to make sure that everyone had a chance to help build any proposed solution, but the biggest challenge that we had was that the team is so busy with their respective projects, getting them all in a room together at the same time for a workshop session was going to be near impossible. So we created the deconstructed workshop, a way of gathering input without needing everyone in the same place together. 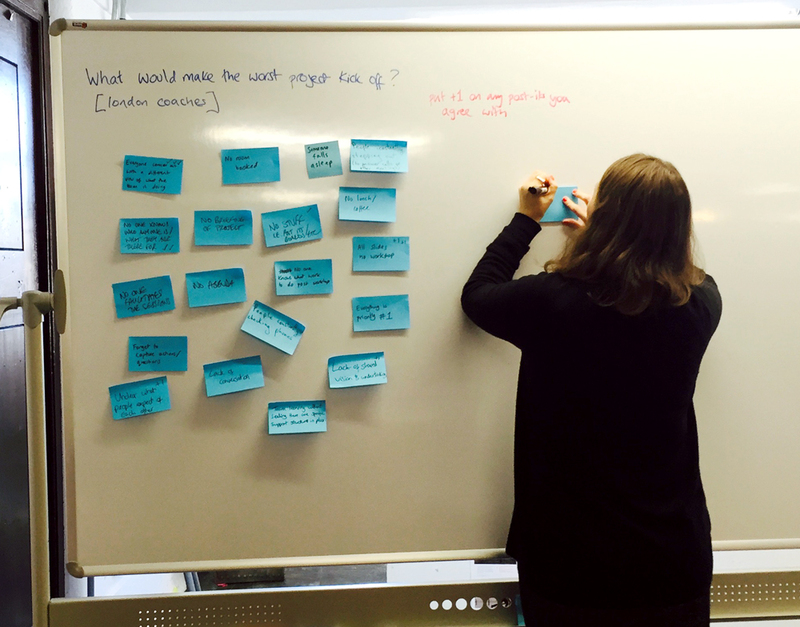 We put a whiteboard, post-it notes and pens in a public space that everyone could easily get to, emailed out the workshop instructions (which in this case was the anti-problem) and invited them to go to it at some point during a set day to add post-it notes. We were sat working near the board, so could answer any questions if needed. It was pretty successful and we got some great input, which we just wouldn’t have been able to get otherwise. It helped that we had already started people thinking about kickoff workshops through a short questionnaire that we sent out the week before, the deconstructed workshop also reinforced the answers to those questions. The team also been together for a while, so already trust each other, I don’t that it would work as well if the team didn’t know each other.